The Council on International Education Exchange (CIEE) is offering grants for their Fall 2019 Open Campus study abroad programs. These grants are available to students doing any 3-block Open Campus program, regardless of location or combinations. For information and nominations, please visit ciee.org/schoolgrants. Students can also visit ciee.org/dyo to design their own program from the 12 locations, 7 academic tracks and academic project options available in fall 2019. Nominations are due by Monday, April 15, so if you’re interested, please make a study abroad appointment through the CMU Study Abroad Portal at your earliest convenience to discuss this opportunity further. If you have any questions, please contact GoAbroad@andrew.cmu.edu. Applications accepted on a rolling basis from July 1 through June 30. 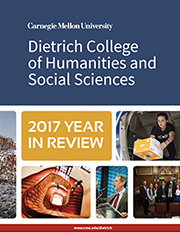 The Dietrich College Summer Internship Opportunity Grants Program makes it more possible for students to take advantage of less remunerative but worthwhile summer internship opportunities. The goal of the program is to minimize or eliminate any out-of-pocket costs to students who receive and accept an offer from such an internship sponsor, and particularly for students who would not be able to participate in a low- or unpaid summer internship without this support. Grants of up to $2,000 per internship are available. Open to currently enrolled undergraduate Dietrich College students, BHA students and SHS students with a Dietrich College primary major. The Peter C. Dozzi Pittsburgh Internship Initiative was created in 2004 through a gift by Mr. Peter C. Dozzi, founder of Jendoco Construction Corporation. Dozzi Scholarship money is made available through the Career and Professional Development Center for undergraduate and graduate students who will be staying in the Pittsburgh region to complete a summer internship experience. Scholarships of $1,500 each are awarded to individuals who have received an offer for a low-paying or unpaid internship and are enrolled in classes for the fall 2019 semester. The CMU Summer Internship Experience Fund will be available to current undergraduate students who are participating in off-campus, low paying or unpaid internships located in the United States during the summer of 2019. The Fulbright U.S. Student Program provides an unparalleled opportunity to teach, study and conduct research in over 130 countries worldwide. Current juniors (graduating 2020), seniors, recent graduates, current graduate students or alumni. The Marshall Scholarship is for U.S. citizens with an undergraduate GPA of at least 3.7. Seniors, graduate/professional students and alumni may apply within two years of earning their undergraduate degree. The award fully funds one to three years of study leading to a degree at any British university.